Kelty Tru.Comfort Camp Bed Double-Wide Inflatable Sleeping Pad is an incredibly comfortable 12 cm thick and 145 cm wide pad for car camping, a great value for the price. Kelty Tru. Comfort Camp Bed Doublewide Sleeping Pad. Stuff sack doubles as the pump sack. Very easy inflating and deflating. This Kelty Tru.Comfort Double Camp Bed is a new item on the market, a part of the series which also includes a single sleeping pad, as well as the single and double sleeping bag; they all have the “Tru.Comfort” words in the name. So these sleeping pads can fit nicely with the bags from the same series. As the name suggests, this is an inflatable pad and here you have a few interesting features. The carry bag doubles as the inflation bag. You will see how it works in the video below. This saves you from using lungs to inflate this huge pad, and with this you also avoid moisture from your breath accumulating in the pad. 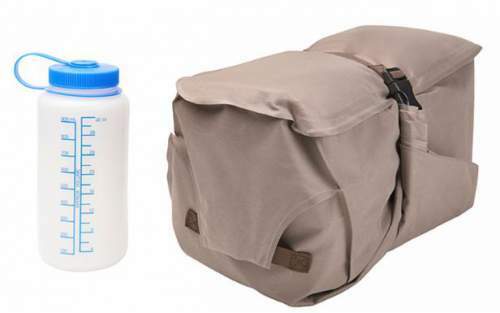 This double-purpose carry bag is really nicely designed, so this is yet another gem from Kelty, they always have something unique in their items. The pad is obviously double size, and here this really means double because you have 57 inches (145 cm) width. Now, when you realize that it is also 78 inches (198 cm) long, and 4.75 inches (12 cm) thick, you understand that it is very justified to use the words “camp bed” as they do in the name of this tool. Weight-wise, this pad is quite heavy, so you can understand it both ways, as good and as bad. The good is that the weight reflects what you have here – a super comfortable large and thick pad. So this is a tool for car camping, and for couples (or for solo use) who do not want to sacrifice comfort for grams. The bad is, you would not want to carry it in the backpack, it is 7 lb 13 oz (3.5 kg). So if you need a double-wide pad to carry on the trail, better check this Klymit Double V which is more than 3 times lighter, yes you are reading correctly, it is only 1.1 kg. Sizewise, I already mentioned its dimensions, so clearly this pad provides more than enough space for two adults, 145 cm is the width of the double bed I have at home. Note also that it is much wider than the mentioned Klymit pad which is only 119 cm (now you realize why such a big weight difference). Packed size 18 x 10 x 9 inches (46 x 25 x 23 cm) is such that you can transport it even on a bicycle or on a motorbike. This is the double pad nicely packed in its carry bag which doubles as the pump sack. I already mentioned the stuff sack which they use to inflate the pad. They call it the Vortex system and it has some unique details in how the sack is attached to the pad and how it inflates the pad. The valve is built to triple the amount of air flowing into the bed, something related to the Bernoulli principle, I am a physicist by profession but this may be boring for some of you. The port is wide open and attaching the sack is very easy. The roll-top on the stuff sack helps you to trap the air in the sack and you then simply pressure it out into the pad. The pump sack is constructed nicely so that pressing the air is easier than in many other tools of this type. Note that you have one-way gasket built in so that the air does not get out when you capture the air in the pump sack and force it into the pad. You will do this around 5-6 times to pump the pad. Because of such a wide valve, deflation is in seconds, so you will not have to wrestle with this pad to deflate it. Attaching the stuff sack as the pump sack. So the baffles structure is transverse (some use the word “horizontal” which does not sound appropriate). This is better than longitudinal baffles where the edges are less stable so you lose the part of the actual useful width. The edges are completely vertical here. But note that longitudinal baffles are better for some other reason – the pad is effectively stretched when pressed with your body so you get more in the length. Yes, you have the same with the width in the case of the transverse baffles. But with transverse baffles which you have here, you also have less bouncing, this structure acts more like a real bed. Now you understand why Klymit uses diagonal baffles – they incorporate the best (and the worse) of both transverse and longitudinal baffles. Here you have a layer of antimicrobial TPU which is stable and strong and it does not stretch, so it adds to the durability of this pad. The main fabric is also a very durable 75D polyester. They claim that there is 140 grams of synthetic insulation, but they do not provide any info about the effective R-value. My guess is that it is below 2, but this is just a guess. I am going to ask them, and if I get any info I shall add it here, so stay tuned. Addition: Kelty replied about the insulation, and this is the part of the message “These actually don’t get tested for R-value, because they are considered similar to an airbed. Hope this helps!” Does it? Very durable & tough materials. Type: inflatable, double sleeping pad. Weight: 7 lb 13 oz (3.5 kg). Dimentions: 78 x 57 x 4.75 in (198 x 145 x 12 cm). Packed size: 18 x 10 x 9 in (46 x 25 x 23 cm). So this was my Kelty Tru.Comfort Camp Bed Double review, as you realize Kelty has again built a nice outdoor tool with some great features. The price is very reasonable for such a great pad, and I can fully recommend it. You might want to check also this Kelty Tru.Comfort double-wide sleeping bag which I reviewed in my separate text. This is the best combination with such a pad. If you still need some different pad, please check my page with pads, there are many great models reviewed in detail. 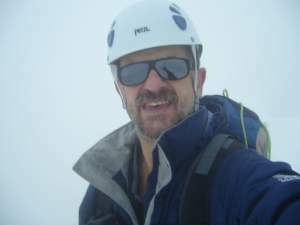 In particular, check this Exped MegaMat Duo 10 which is of the similar size and also this ALPS Mountaineering Lightweight Self-Inflating Double Air Pad which is a 2-in-1 pad, single and double. 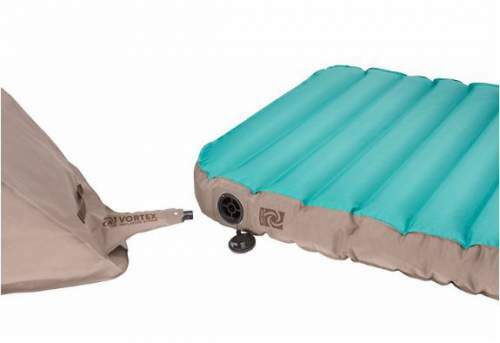 But see also this ultra-lightweight Exped AirMat HL Duo Inflatable Sleeping Pad and this Therm-a-Rest NeoAir Camper Duo Sleeping Pad with its dual chamber design.